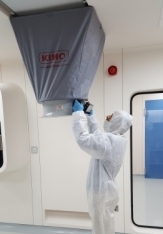 The rate and movement of clean air into and around the cleanroom or containment device is critical to ensure international standards are met. e-bbex can offer a comprehensive array of airflow testing and visualisation services. 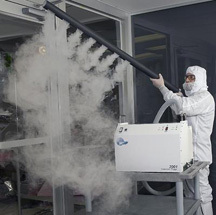 When a cleanroom is designed it will need to meet specific requirements for the amount and distribution of clean air around the room. This is usually expressed in terms of the number of air changes per hour. 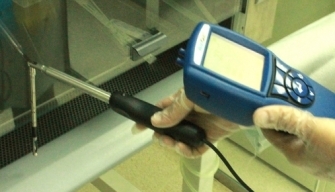 By measuring the air flows into and out of the cleanroom the number of air changes can be calculated. It is also important to ensure that there are no dead-spots where clean air isn't circulating this is assessed by means of airflow visualisation tests which can determine the direction and movement of clean air around the room. In cases where air flow is necessarily high e.g. in rooms of ISO class 5 or better it is also important to measure the air flow velocity - i.e. the rate at which any particles that are generated in the cleanroom are carried away form the critical operational areas. 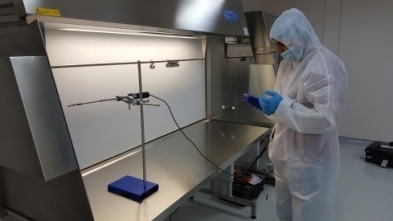 Airflow is equally important in containment devices such as Biological safety cabinets and laminar flow cabinets to ensure that there is consistent adequate uni-directional flow of air into and around the device. 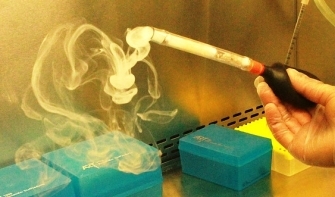 The inflow of air through the work openning into microbiological safety cabinets ensures that any aerosols generated inside the cabinet cannot escape into the outside environment while the uni-directional downflow of HEPA filtered clean air inside the cabinet ensures that the samples being manipulated in the cabinet are kept uncontaminated. e-bbex fully qualified staff can test and certify your safety cabinets and laminar flow cabinets to ensure they pass either NSF/ANSI 49; EN 12649 or ISO 14644 standards.